Coffee Sense is pleased to offer a great coffee from the well-known coffee producing Zelaya family in the famous Antigua region (coffees grown in the Antigua Valley area surrounded by three volcanoes - Agua, Acatenango and Fuego). Santa Clara, located in the southern slopes of the Antigua Valley between 1550-1800 meters above sea level, is privileged to have some of the finest volcanic soils for the cultivation of speciality coffee. Ricardo Zelaya, the fourth generation to produce coffee at Santa Clara, has managed the farm operations since 1988. The coffee at the plantation is cultivated under strictly controlled shade trees allowing the coffee plants to receive the ideal amount of sunshine required to produce fine and aromatic coffee. There has always been a commitment to preserving the natural conditions of the land through ecological stability as various family members have taken over the farm operations over the years. Santa Clara won many awards for quality such as the Guatemala Cup of Excellence in 2001, 2009, and 2010. 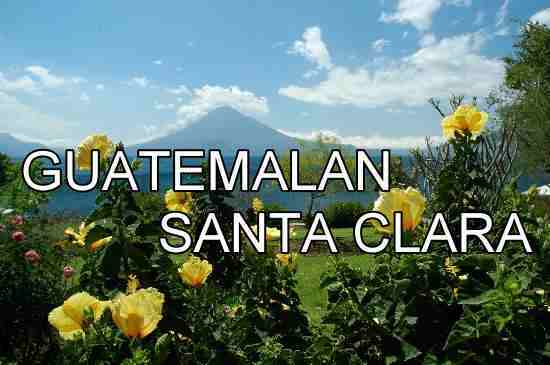 So what can you expect from Guatemalan Santa Clara? A big beautiful, creamy, juicy mouthful and a lovely deep ripe sweetness, flavour notes overflowing with fruit notes such as peaches, apple cider, plums and apricots with a lovely long sweet finish, with flavours of butter and well balanced chocolaty malt/spicy acidity.